Are you tired of your agents having inferior weapons? 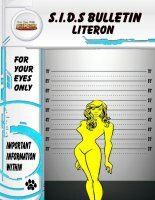 Tired of your lackeys falling like flies to the superheroes of the world? 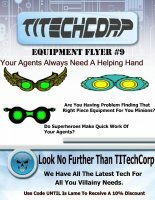 Tired of those dim witted Until agents having better equipment than your agents? Then you have come to the right place here at TITechCorp we are dedicated to creating the best weapons, armor and other equipment money can buy. So stop by today and pick up the latest blaster or force belt and get a jump on those pesky do-gooders. And remember your satisfaction is guaranteed or we won’t see you again. Small list of equipment to add to your Champions campaign includes Hero Designer files. S.I.D.s is short for Super-powered Individual Database. This is a database that various government agencies are starting to use to keep track of all the various villains and heroes. Over the last few years the number of super-powered individuals has skyrocketed. S.I.D.s Bulletin is a flyer that will highlight solo villains that have come on to the scene. 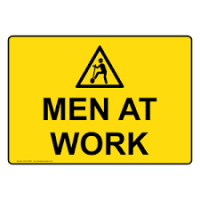 The same care will be taken with their entry as with those in out S.I.D.s Report. The known history and abilities all will be given. This is a series of small products that will introduce new villains and heroes for you campaign. This individual is made of pure light and can cause all kinds of chaos and destruction. She never asked for her abilities - but she is enjoying them nevertheless! This 7 page PDF includes Hero Designer files & printable cardboard miniature. An official announcement from our friends fans at Green Ronin! "For far too long, we here at Green Ronin have stuck our head in the sand and focused entirely on the Mutants & Masterminds game engine, ignoring the many other superhero game systems that came before. And ultimately, that kind of myopia doesn’t benefit anyone but ourselves. Our fans deserve better. 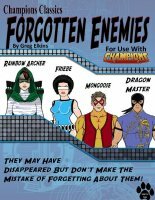 We’ve long partnered with Steve Kenson’s Adamant Entertainment to bring you Icons Superpowered Roleplaying, and so we have reached out to the creators of other amazing superhero game engines, both active and defunct, to begin the new Mutants & Masterminds System Upkeep, Collaboration, & Knowledge Exchange Roundtable. Our goal is to bring you the great Mutants & Masterminds products you love, for the systems you play!" "Releasing at the end of this month is the new Mutants & Masterminds: Deluxe Champions Handbook, powered by classic Champions 3rd edition! Everything you need to play a Champions-powered Mutants & Masterminds campaign, complete with extensive point-buy systems our fans already love, plus tracking END to pay for your powers, sorting your attacks in Killing and Non-Killing, and many other elements that add a much-needed authenticity M&M has always lacked. A lot of you will ask “why not use Hero System, Sixth Edition or Champions Complete?” And that is an excellent question. One which I have no answer to. Licensing is a strange mistress and the rites must be observed." Here you will find villains of old back from their self induced hiatus and ready to pounce on the world again. Villains from some of Hero Games older material that have yet to be upgraded to 6th edition. Some of your favorite or perhaps “lightly” used villains perfect to inject into a new Champions campaign. 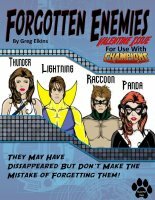 In this installment 6th edition stats for Thunder & Lightning, Raccoon & Panda are given including Hero Designer files & printable cardboard miniatures. Folks, we've had a major hiccup with the website, and lost the links to something like 99% of our electronic files during an upgrade process. They are going to have to be restored manually, and that's going to take some time. If you have any problems getting an electronic product you've paid for while my staff and I are working on this, contact me through the website and I'll send it to you from another source while you wait for it to appear in your account. 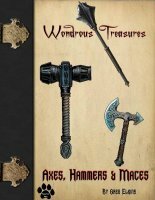 Every fantasy hero campaign needs magical treasures for the adventures to find. This series houses information on varies information on just such treasures. There are legends that tell of heroes with an axe that can cut through any substance or a hammer that returns when thrown. Maces that can destroy undead or even cause lightning to strike. Adventurers want them and search dungeons oe even search through a dragon’s hoard for them. The ZIP file includes the PDF and Hero Designer files. Welcome to the next installment of Monster Mash. 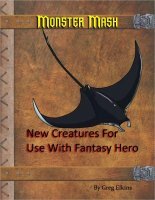 Here you will find new creatures and/or new takes on old creatures for your Fantasy Hero Campaign. This installment will cover a new creature Shadow Ray & Zorbo. One of these creatures is not natural to this plane. The other has been the downfall of many gullible adventurers. They are both aggressive and dangerous creatures to encounter. Neither should be taken lightly or thought of as simply an animal to be dispensed. It has become a full time job to try and keep track of them as well as update information about the, that is the purpose of this database. The database is designed to give law enforcement as much information as possible on supervillains or superheroes they may need to call for help. Includes PDF, 114 pages, with Hero Designer files & printable cardboard miniatures. Many villains are always in the news; many are always on our minds. Some however, have not been seen for years and to some this means that they are retired, in jail or dead. Only if this was in fact the truth of the matter, but it isn’t. Many villains have gone into hiding while others are simply enjoying the fruits of their labor. Some are sitting on a secluded beach getting a tan or perhaps amusing themselves in a casino or nightclub in a friendly country. Still others are upgrading their tech or learning some new ricks to use on heroes and law enforcement. The truth is that all villains aren’t created or driven in the same way. Here you will find villains of old back from their self induced hiatus and ready to pounce on the world again. Villains from some of Hero Games older material that have yet to be upgraded to 6th edition. Some of your favorite or perhaps “lightly” use villains perfect to inject into a new Champions campaign. In this installment 6th edition stats for Rainbow Archer, Frizbe, Mongoose, Dragon Master will be given including Hero Designer files & printable cardboard miniatures. This expansion deck for Champions Character Creation Cards contains an additional 54 ability cards! These include 17 one hundred point red cards, 18 fifty point yellow cards, and 19 twenty five point purple cards. For use with Champions Character creation Cards core deck. The electronic portion of this product contains not only additional, expanded card descriptions and HD files, but also a print-suitable version of the card deck so the purchaser can print additional decks or cards at home when needed!